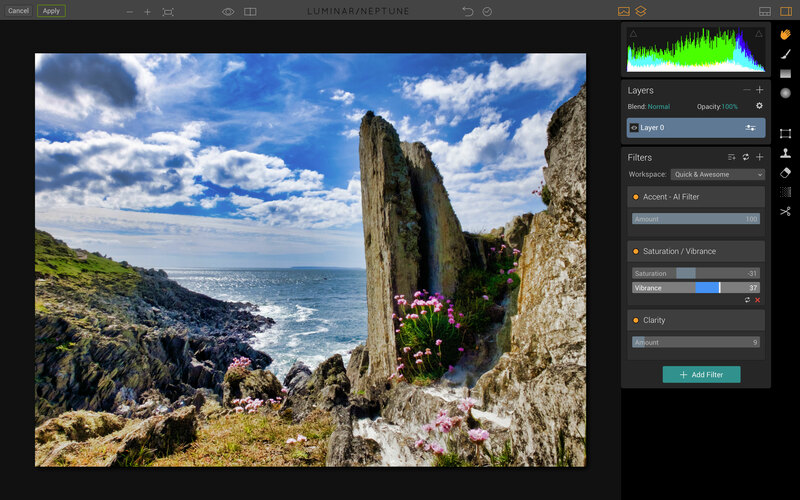 MacPhun has updated its innovative photo-editing app to Luminar 1.2 ‘Neptune’, adding a number of new features. One of these is the new Luminar Quick & Awesome workspace, which is designed to bring three key filters for getting awesome results quickly. These are the new Accent – AI Filter which we’ve covered separately, the Saturation/Vibrance filter and the Clarity filter. So is it the perfect one-stop fix for all your photos? Let’s take a look. You’ll find the Workspace menu right at the top of the Filters panel on the right side of the screen, and the Quick & Awesome workspace is right at the top. 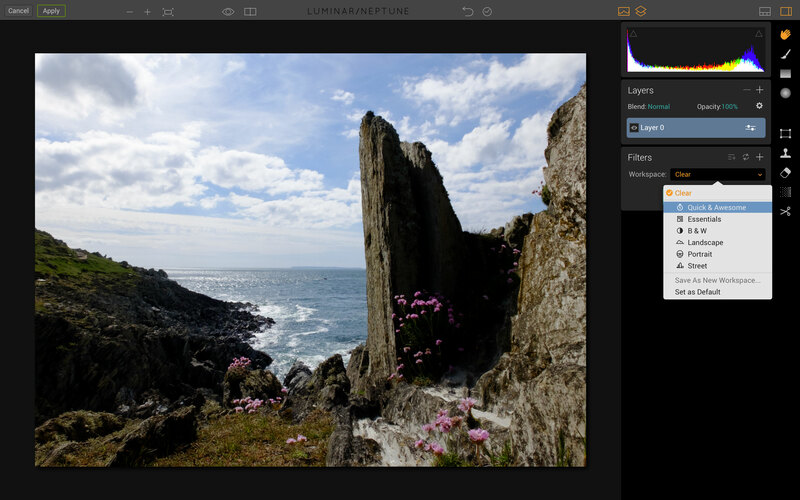 As with all the Luminar workspaces, it contains a specific set of Filters for the job in hand. They’ve certainly got their work cut out doing anything with this image, which has a full range of tones but too much contrast and too little colour. We’ve found a combination of filter settings here that certainly makes a big difference, though they’re not all doing the same amount of work. We tried this out on dozens of images and found that really it’s the Accent – AI Filter that does all the useful work. It also pumps up the saturation, and the Saturation/Vibrance filter is handy for toning it back down again. It’s worth taking a few moments to play the Saturation and Vibrance sliders off against each other to find the best result. The Saturation slider adjusts the strength of all colours equally, while the Vibrance slider boosts the weakest colours and leaves the strongest alone. The Clarity filter and the Accent – AI Filter do not make a good team, however. Both produce a strong localised contrast effect and if you use them together you can get strong glow effects around objects, particularly those against a blue sky. The Clarity filter also has the effect of reducing saturation, so this time you’ll need to Saturation/Vibrance filter to bump it back up again. So in practice you’d probably use the Accent – AI Filter for some images and the Clarity filter for others (it’s especially good for black and white). I’m not sure this is really the ideal trio of filters for a Quick & Awesome workspace. I think I’d drop the Clarity filter and substitute it with the Brightness/Contrast filter. That way, the Accent – AI Filter does the main work and the Saturation/Vibrance and Brightness/Contrast filters can do the fine tuning afterwards.